More and more tuned family estates are available on the market. Usually they have not only a big trunk, but also very nice design and fully loaded engine under the hood. „Touring“ cars are very popular these days and available in showrooms of premium brands such as Mercedes, Audi and BMW. They’ve made really great advance in past years – the newest technology, powerful, luxurious design sometimes with sporting accent – this everything is an ordinary equipment of estates. But sometimes it’s not enough so there are companies to change it. 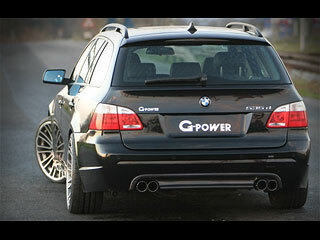 One of these companies is G-Power, a German tuning firm specialized on BMW. And what we have today? BMW 5 Touring. The company ahs decided to modify next member of the BMW’s big family. Thanks to their love for tuning they’ve changed a family estate to this amazing car. In case of cooperating professionals we can enjoy its masterpiece called BMW G5! Everything started with its front part and new front bumper. It has three dominant openings, one elongated in the middle and two triangular on the sides used for cooling engine parts. They include also a pair of halogen lamps hidden behind black perforated sheet covering all openings in the front. Lines of the bumper were designed with the sense, but they’re also quite aggressive. The best thing in this part is a front diffuser with rear spoilers made of carbon fibers. Now we can move to the G5’s side part with installed new sill extensions by G-Power. They look really simple, but they’re distinctive enough to excite sporting image. Also the rear bumper has simple shapes, except its carbon diffuser with interesting design with oval lines to match with the rest. The diffuser also includes four stainless exhaust tips (80mm diameter) providing really extreme sound. The G5’s has obtained also new settings for its suspension. This means a new sporting update decreasing car closer to the road for 25mm. Its owner can additionally change the ride\s height with electronically adjustment. G-Power Silverstone Diamond rims with graphite modification are luxury piece of art in the company’s portfolio. They’re 9.0x20 with 245/30 ZR 20 tires in front and10.0x20 with 285/25 ZR 20 tires at the back. Perfect. The last stop is the engine. It’s a diesel aggregate as we said before. Few years ago diesel engine weren’t so popular but now they’re inseparable and essential part of tuning programs. G-Power has introduced something new in Essen – it’s called G-POWER D-Tronic III. 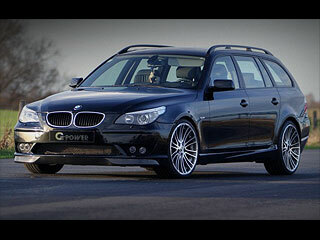 It’s tuning of BMW diesel engines providing performance boost and decreasing amount of emission (-15%). Now we can clearly see that G-Power is one of few companies thinking also about our future. This modification was made on the 3.0 liter 6 cylinder engine and brought additional 20 percents of power. That means total 320hp (272hp in stock) and 680Nm (from 600Nm) of torque. And that’s better feeling and top speed of 268kmph.